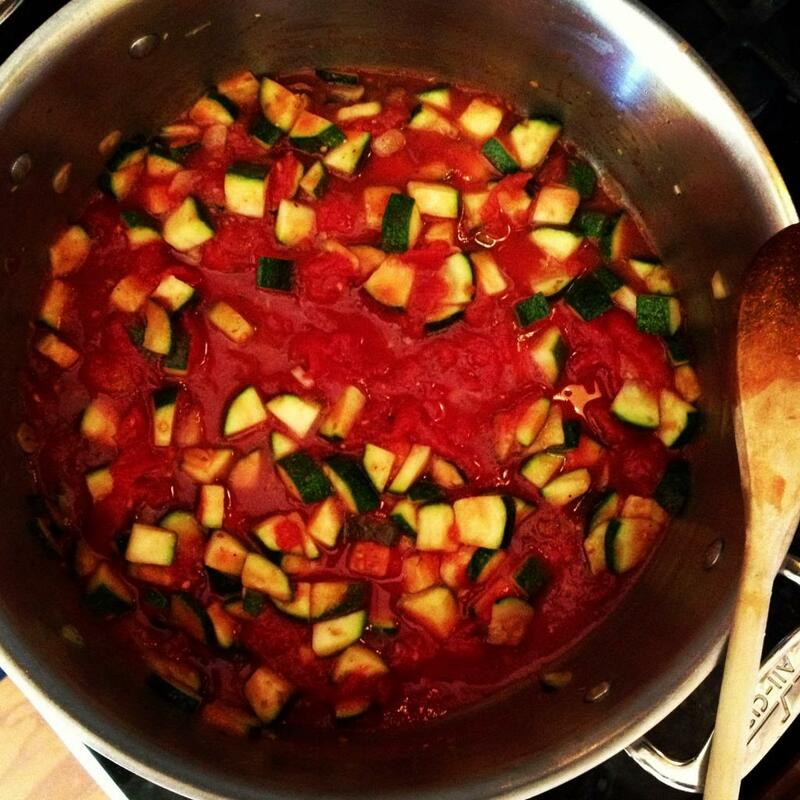 This Italian Zucchini & Tomato Soup has to be one of the easiest soups and one of my favorites. A handful of very simple ingredients, 30 minutes to cook and the flavors are fantastic! 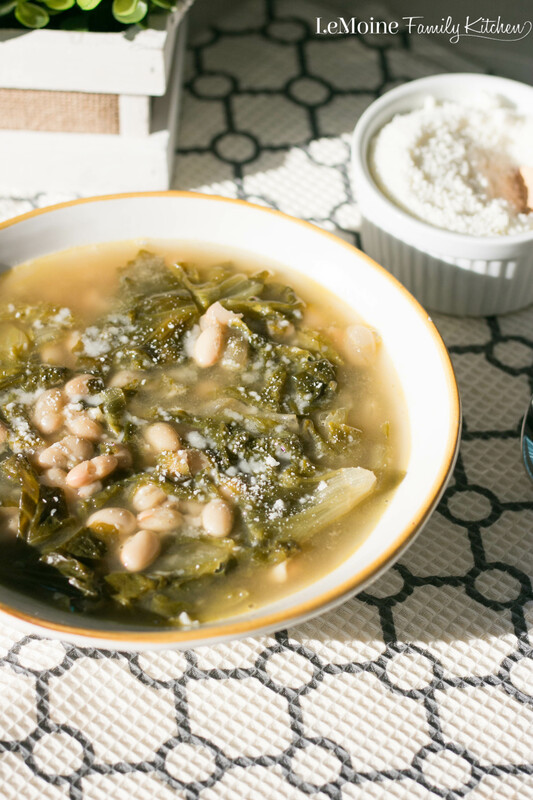 Escarole & Bean Soup. Rustic, simple Italian bowl of comfort right here. Dinner is on the table in 30 minutes with this delicious recipe. Sweet Potato & Butternut Squash Soup. Smooth, velvety and so full of flavor. 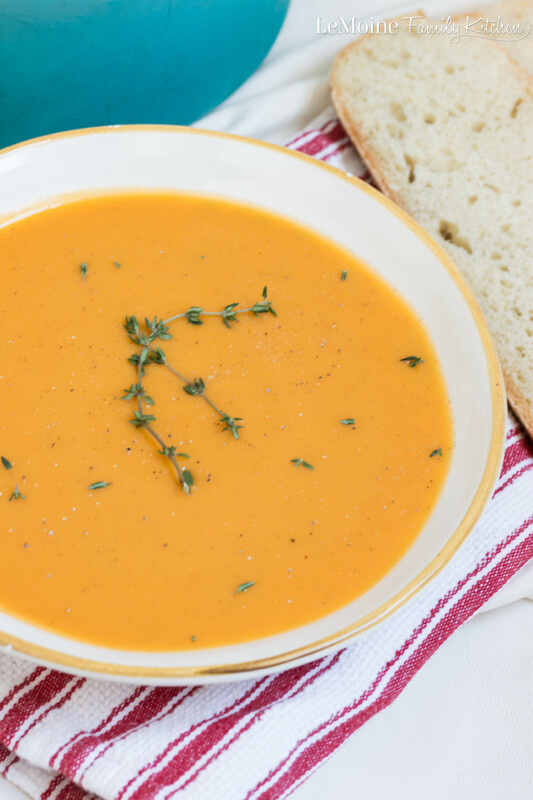 This comforting bowl of soup just screams Fall. 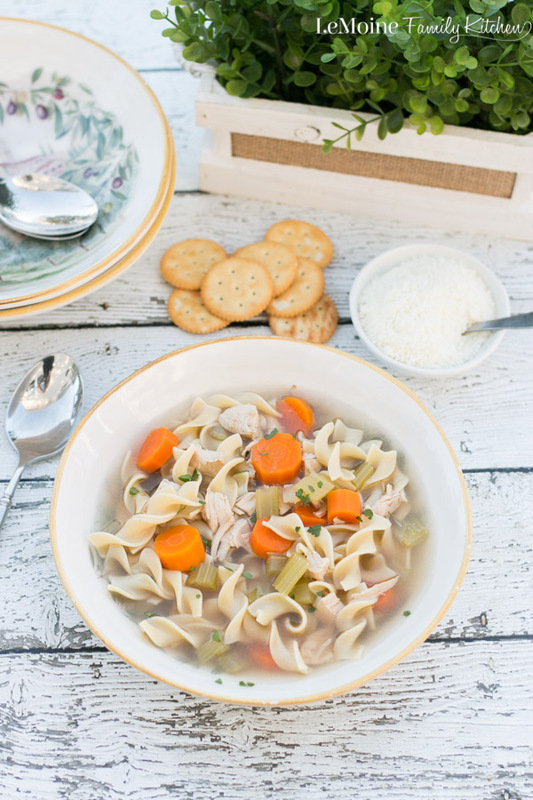 There is something so incredibly comforting about soup, especially Chicken Noodle Soup! There is nothing I want more on a cold day then a blanket and a bowl or two of this soup! 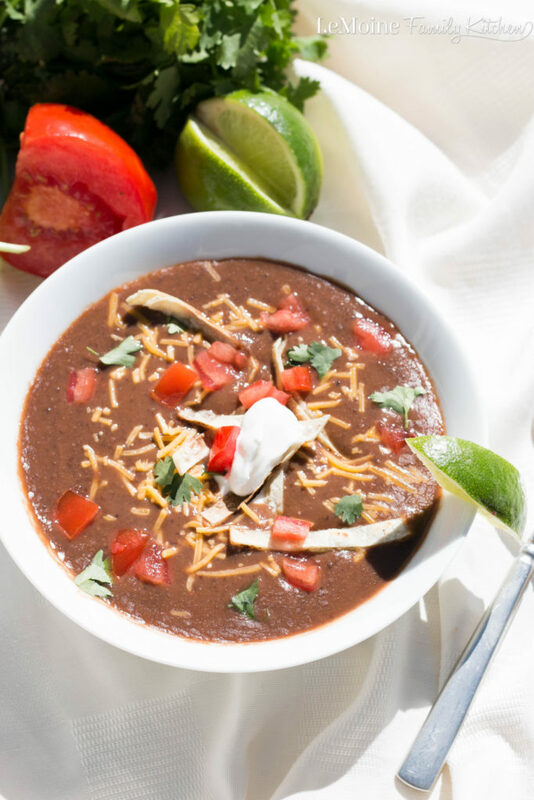 The flavors and ingredients are simple but it is a damn good bowl of homemade soup! I make soup very often. I grew up eating it often and I just find it so comforting and versatile. Really when it comes to soup be creative and play with the protein, veggies, grain or pasta. Chicken Noodle Soup is one of my favorites!! Its super simple to make, there is nothing complicated or fancy about it but it is all you need to warm you on a cold night or if you’re fighting off a cold. 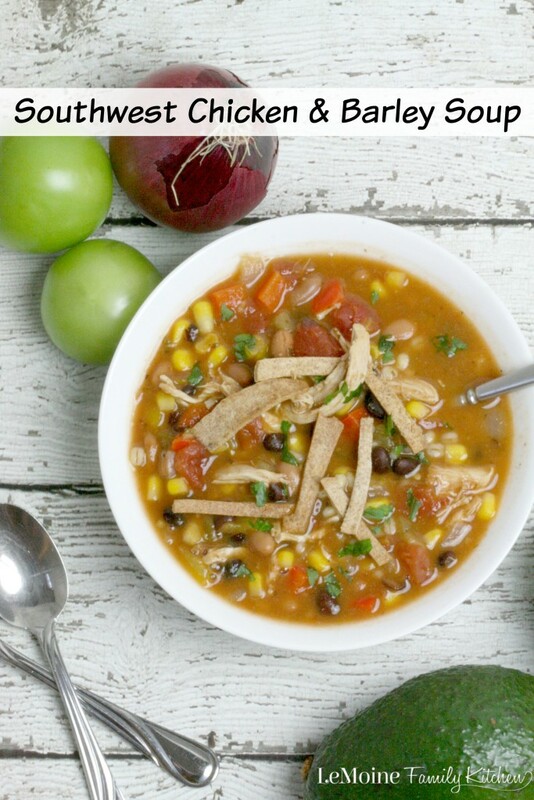 I love Mexican food and I love soup, so while working on my clean meals for the next week I came across a tortilla soup picture on Pinterest. I came up with my own version and it was seriously delicious!!! I devoured 2 bowls full and no guilt about it because its good for you! 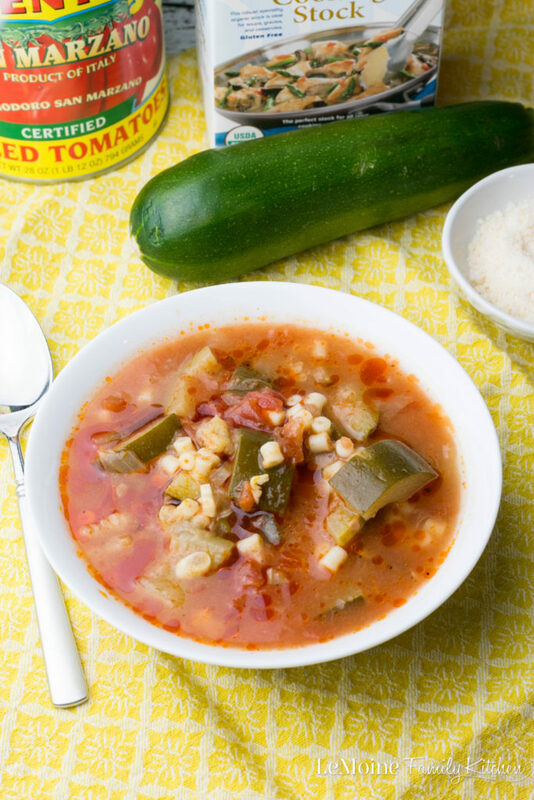 This soup is light and full of flavor. I use ground chicken here but you can easily use diced or shredded chicken as well. 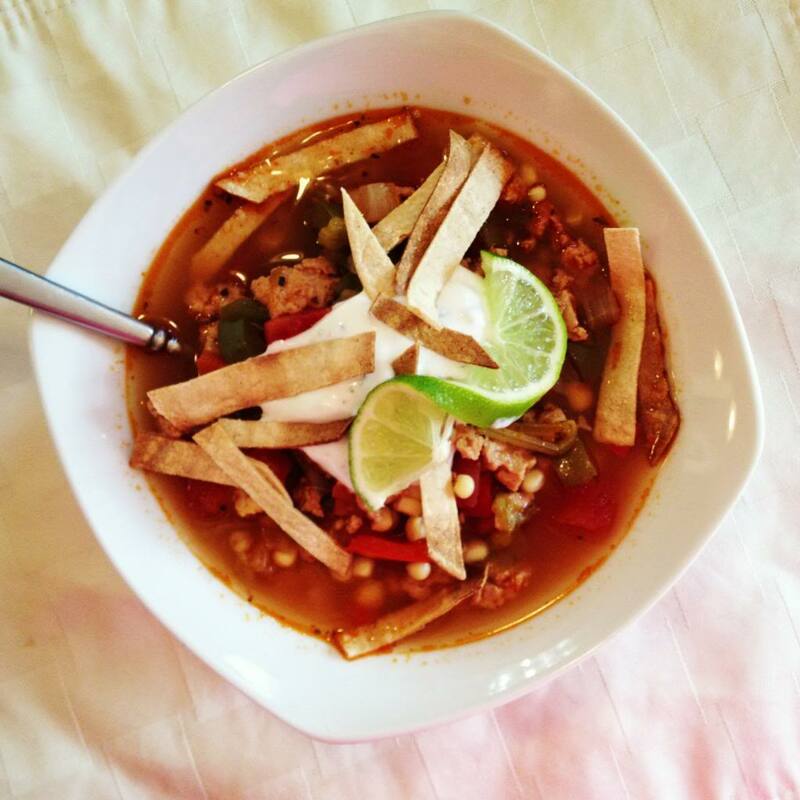 Full of bell peppers, chilies, tomatoes and homemade broth (store bought works fine too- preferably low sodium) and finished off with a non fat cilantro lime crema and baked corn tortilla strips. This will be a new favorite go to recipe! I don’t know about your part of the world, but here in NJ, we have been getting a LOT of rain! These days immediately put me in the mood for a giant bowl of soup. I’m going to keep things going with the clean eating with this one as well. 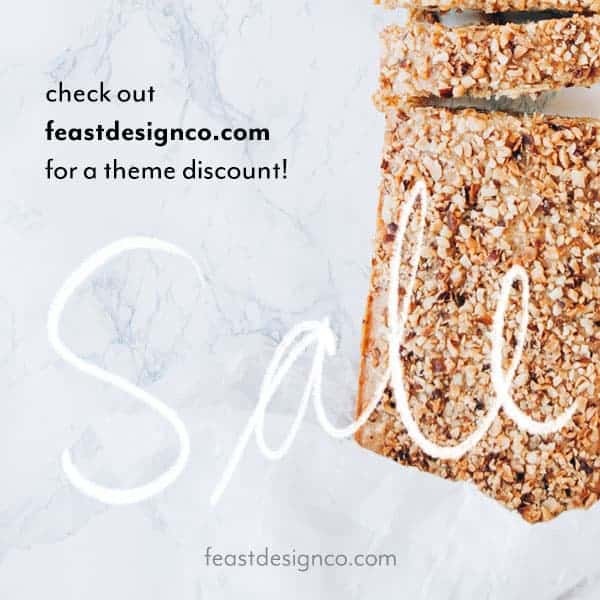 If you missed the post on what the heck this clean eating thing is all about, please check it out, super important steps i’m taking to lead a healthier life. 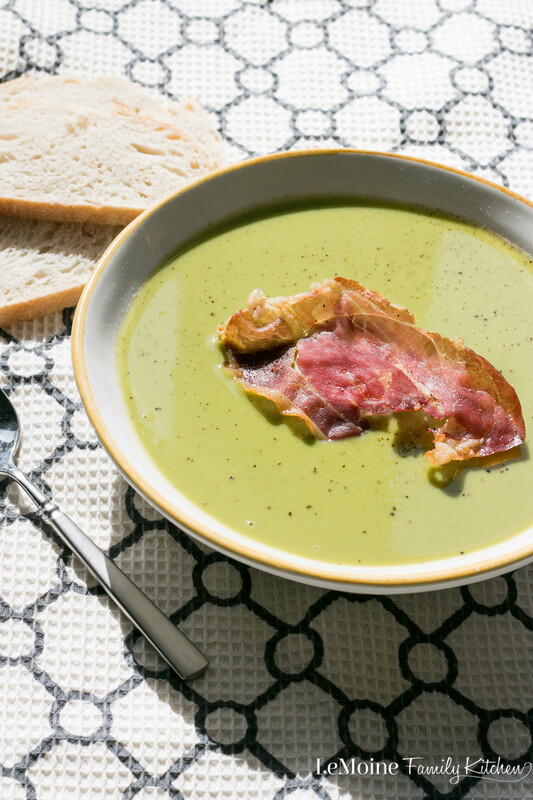 This is such a simple soup to make, so simple that my 4 year old did plenty of the work! Quick side note, don’t know if I ever mentioned, but what feels like a million years ago I actually worked as the head cook of a gourmet shoppe.. this was always a hit! 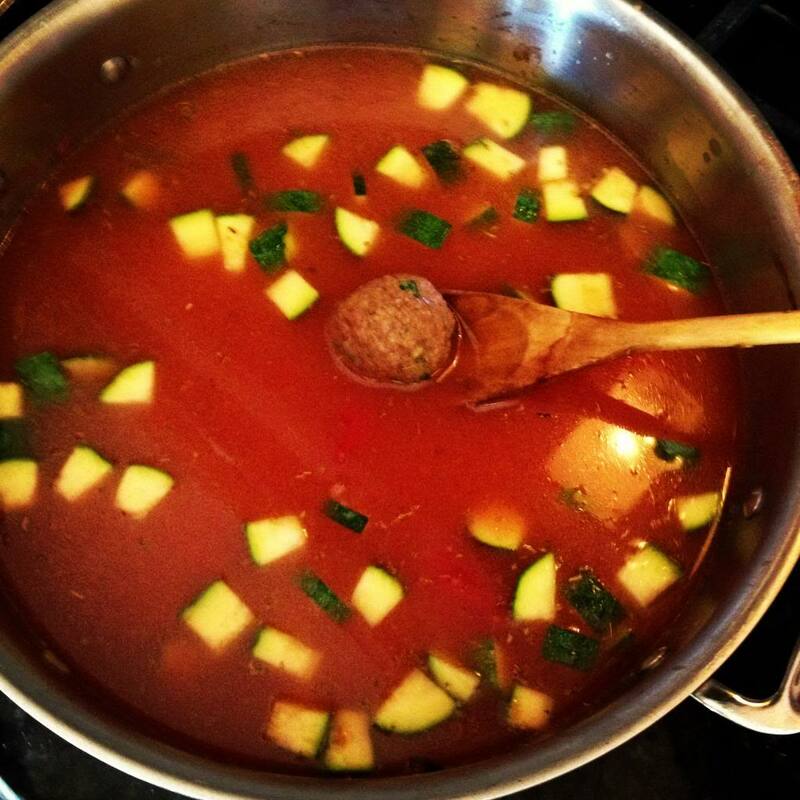 Just a handful of ingredients make up this light yet filling Italian Zucchini, Tomato and Turkey Meatball Soup! 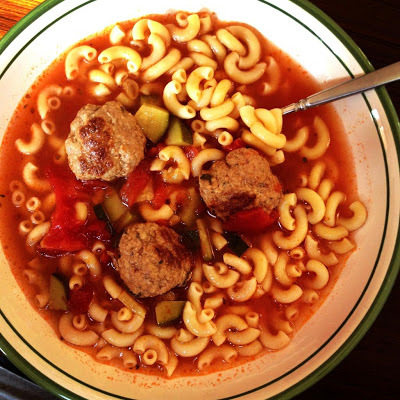 Both my boys really enjoyed this soup as well… bonus! Start with the meatballs. In a bowl mix all the ingredients together. 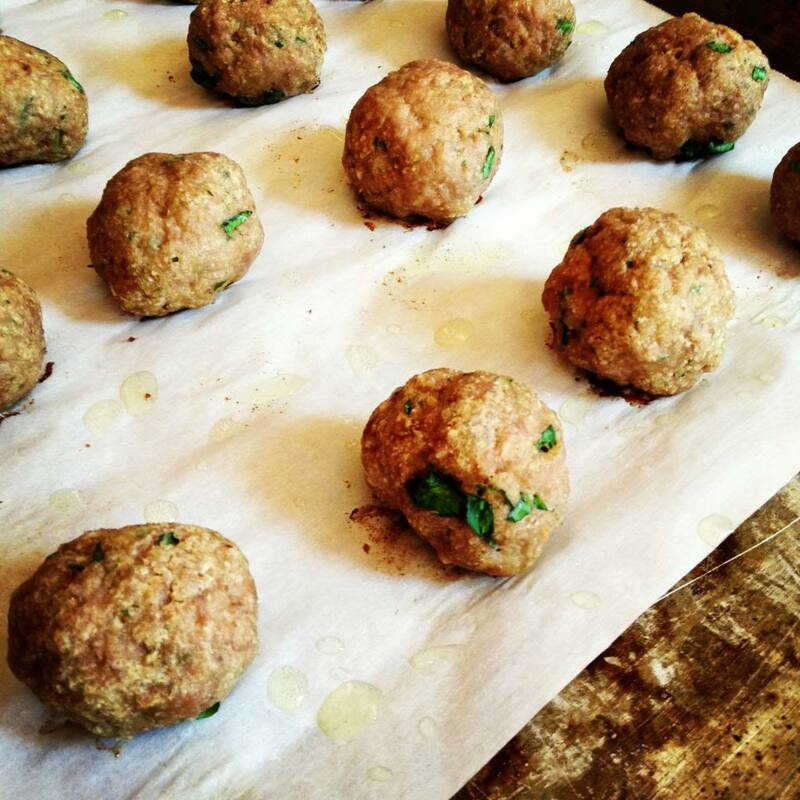 Form into small sized balls and bake for about 15 minutes at 375 degrees. I reserved a handful of meatballs to make a little meatball parm for the boys for the following day. 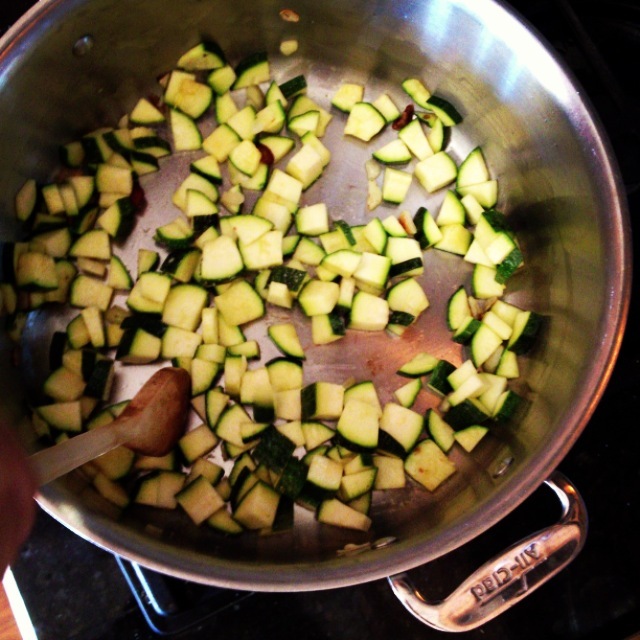 In a large pot, over medium heat, add in just a drizzle of olive oil and the zucchini. Allow to cook until just slightly softened. This is where the big guy really had his fun. 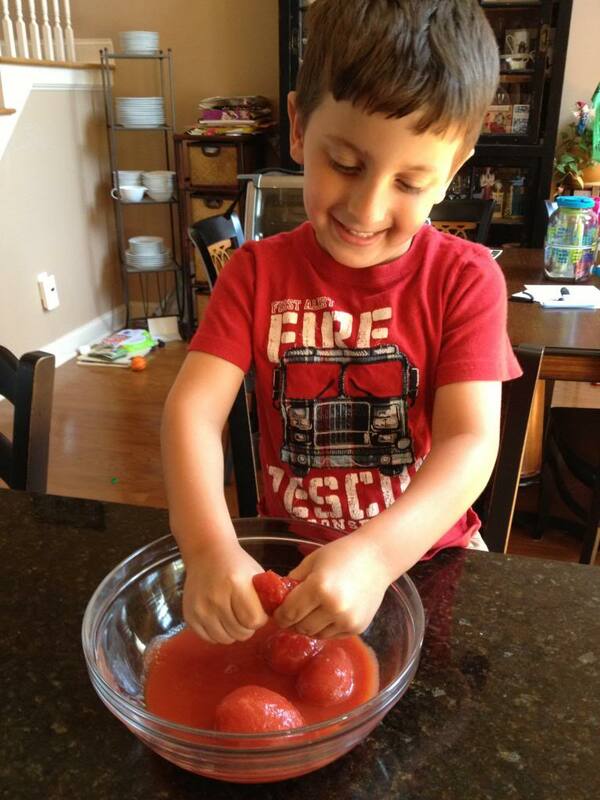 Place all the tomatoes with 1/2 the juice from the can into a bowl, get those hands in there and break up the tomatoes. I don’t mind some bigger pieces but go with what you like. Add the crushed tomatoes and juices into the pot. Season with salt, pepper and oregano. Simmer for 10 minutes. Add in the broth and meatballs. 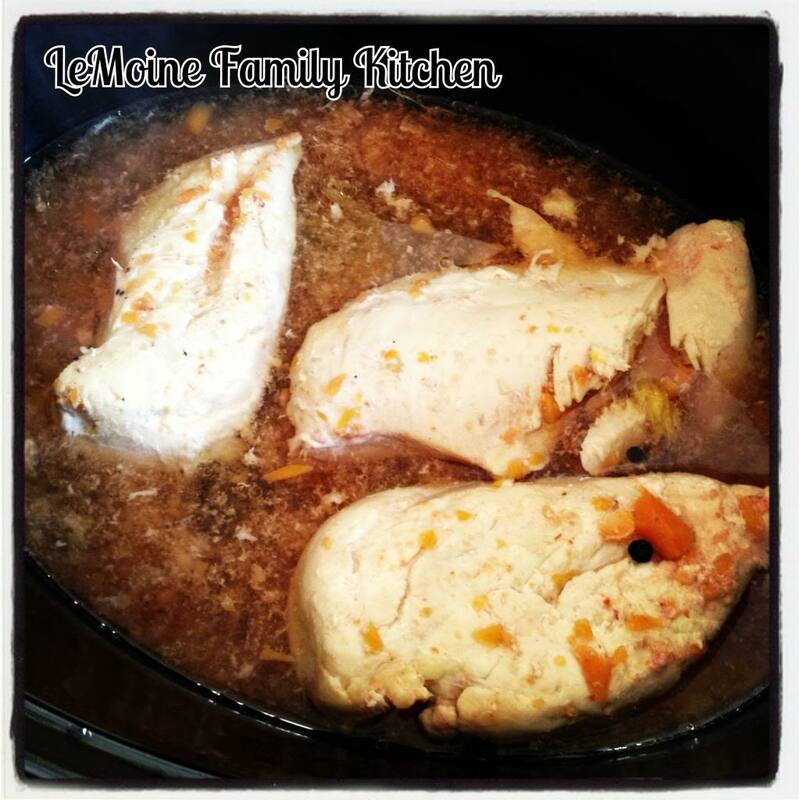 Simmer for 1- 1 1/2 hours. You can serve as is or add in some cooked pasta (zumba night = pasta). If you are looking for a really healthy soup to warm you up, this one is great!!! I’m on day 4 of my Advocare 10 herbal cleanse, that means I have to eat as much “clean” food as possible. That means no sweets, only lean meats, lots of veggies and fruits, healthy whole grains and lots of water! 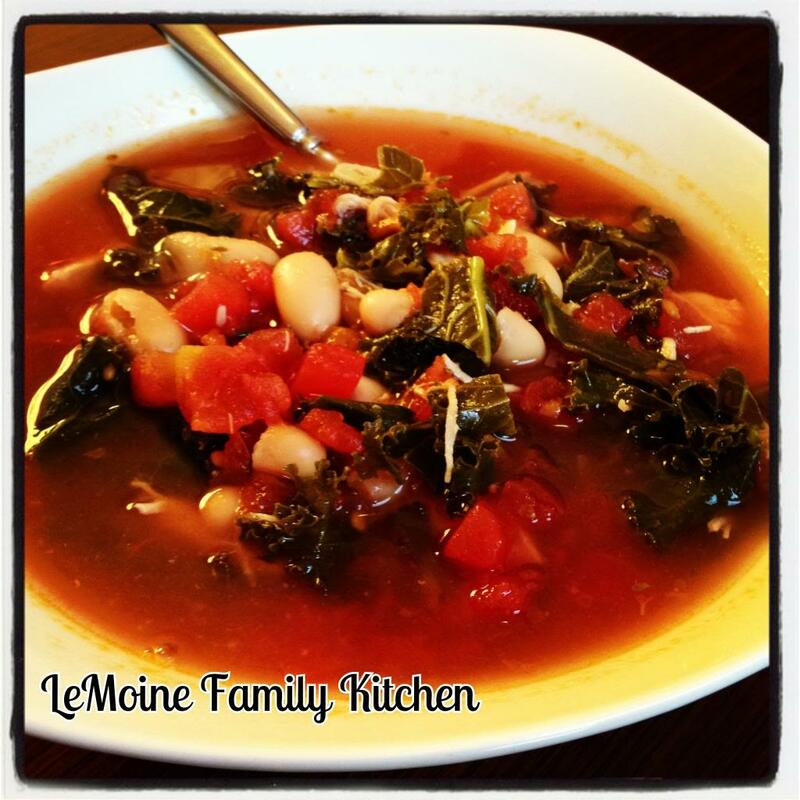 So to keep to all that I wanted to make a soup that was full of veggies and would fill me up, so I made this delicious White Bean, Chicken, Tomato & Kale Soup! I used my homemade broth as the base but you could certainly use store bought, I’ve got my homemade broth recipe for you at the bottom. The only thing I would have done differently (which I adjusted for here) is to have chopped the kale up a bit more because the soup doesn’t cook very long the kale doesn’t have a lot of time to break down and become super tender… smaller chop will do the trick. I started out by popping 3 chicken breasts, a tsp of peppercorns, a bay leaf and a quart of broth into the slow cooker and letting it go on low for 2.5 hours. Once it was done I shredded the chicken using two forks then popped the chicken right back into the broth. I made this for several different meals so you only use a portion here. 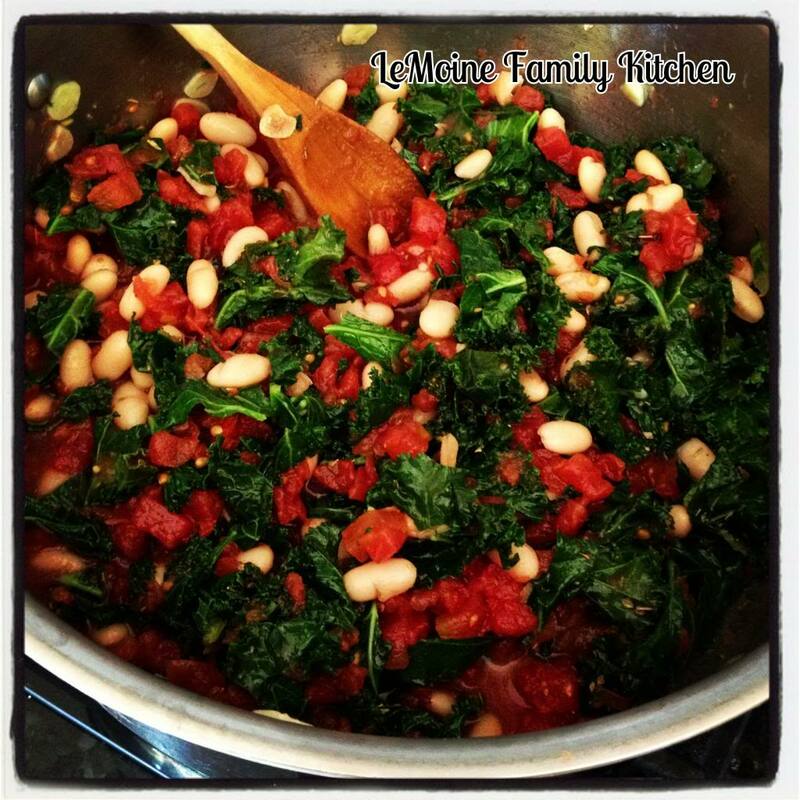 Into a large pot, over medium heat, add a few drizzles of olive oil, the garlic and kale. 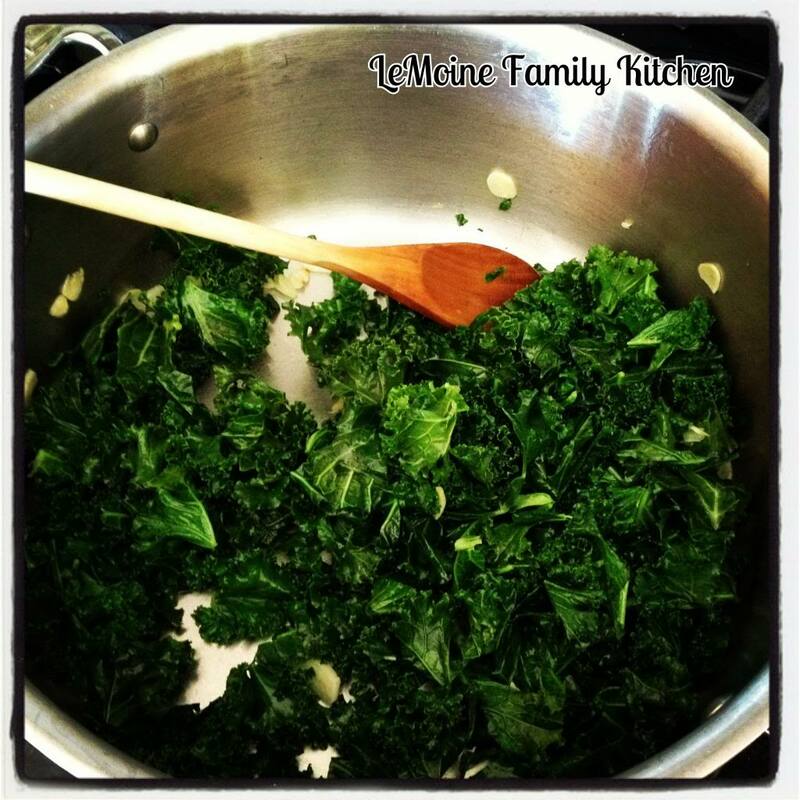 Cook for about 10 minutes until the kale is softened and slightly wilted. Stir in the tomatoes including the juice and the beans. Season with salt and pepper. 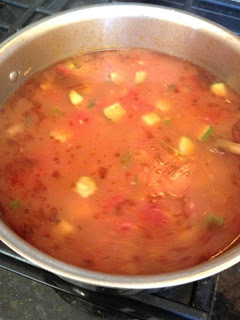 Simmer for 10 minutes to allow the flavors to start melding. Stir in the broth and allow to simmer on low for 30 minutes. Add the shredded chicken in and allow to simmer just a few more minutes to allow the chicken to absorb the wonderful flavors. 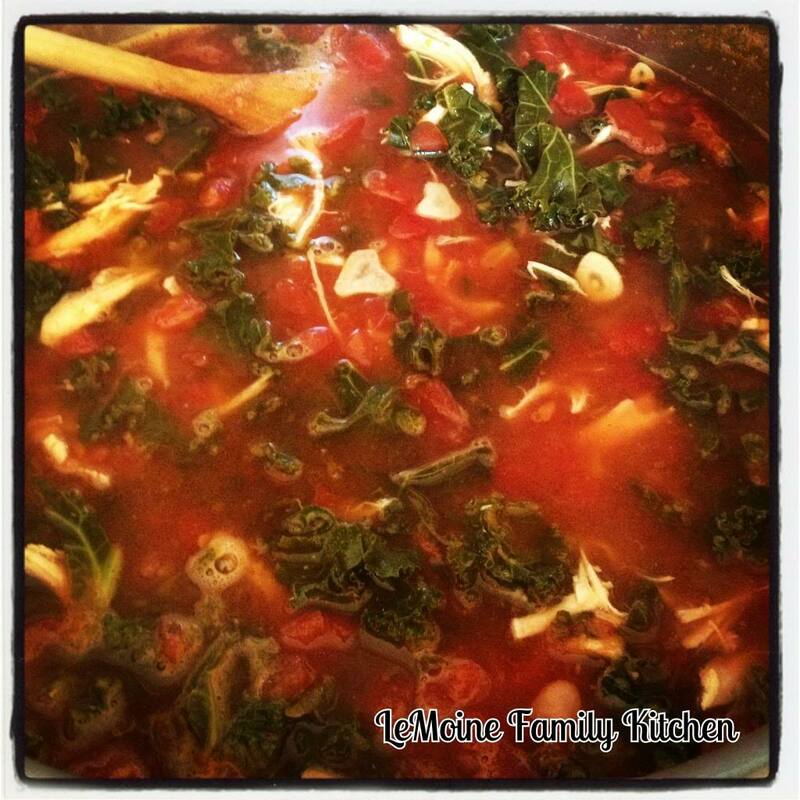 If you’d like to make your own broth heres how…. I make this big batch then freeze in smaller portions. Get the broth going first. In a large pot, over medium low heat, add the water, garlic, carrots (the 6 cut ones only), onion, celery, bay leaf, tomato paste, salt and pepper. Now for the 2 peeled carrots, cut them into large pieces and pop them into a food processor. Pulse until very finely minced, add them to the pot. 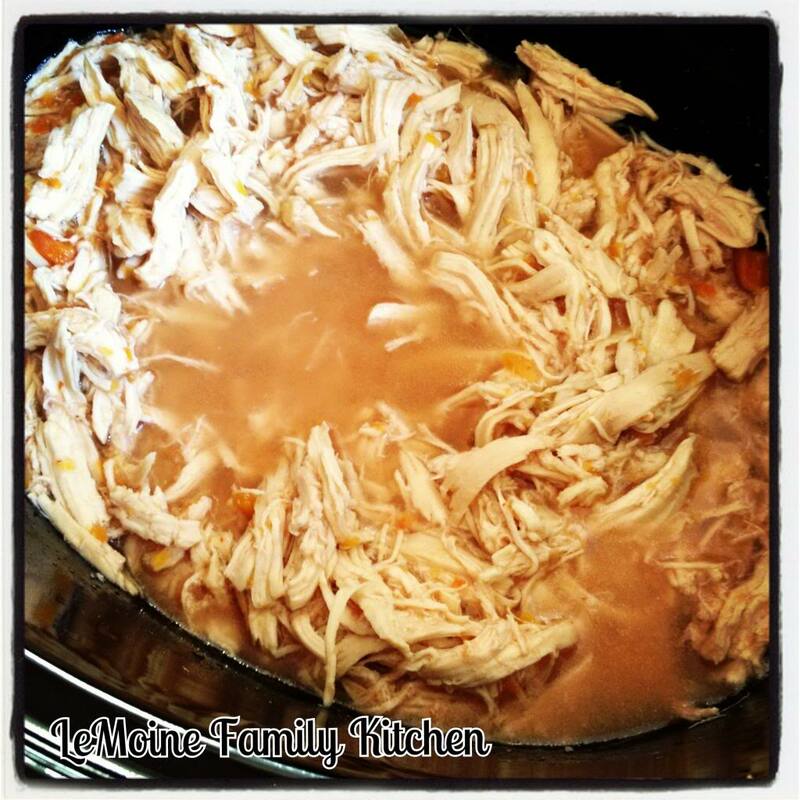 Simmer for 1 1/2- 2 hours.